Trapdoors are one of those rifles that don’t get the respect they deserve. There are Trapdoor collectors out there, but few compared to collectors of other US martial arms. Most of us never even glance at one lying on a gun show table. Yet, the Trapdoor had a pretty good service record in some trying times. After some initial trouble with the early brittle copper cartridge cases, it usually worked and did so in some crummy conditions. Of great importance was that due to being cheap and easy to transition to, it allowed the US Army to convert to breechloaders after the Civil War when the country was flat broke. It served in several battles and wars, including two that had a tremendous impact on our country- the Indian Wars and the Spanish-American War. There was a war or conflict going on during almost all of it’s career. It is the gun that won the west. But it’s history is another story. I’m going to ramble on about the gun itself. People usually call it a “weak action”. Well, it isn’t as strong as a Ruger #1, but that does not make it faulty. Some seem to think that way. I think we have to compare it to guns from it’s period. I wouldn’t shoot anything in a 45-70 Sharps or Remington Rolling Block that I wouldn’t fire in a Trapdoor. The Trapdoor was made to handle a specific loading, and it DID handle it. I have found nothing saying a Trapdoor failed in service due to not being up to the task. The fact is, it’s cartridge was made more powerful during it’s service. Originally loaded with a 405 grain bullet over 70 grains of black powder, the bullet was increased to 500 grains over the same charge in 1881. Duplicate of M1881 on left, duplication of original load on right. The fact it cannot contain a load that is pushing .458 Winchester Magnum levels that was dreamed up 90 years later is of little bearing. A hundred years from now the much-loved Remington 700 may not be able to handle a typical load from the time, but that doesn’t mean it is a bad action then or now. The Trapdoor has some mechanical details and features I find interesting, and I don’t know how many people are familiar with them. By outward appearances, it looks simple as dirt. You might not think there would be anything of interest about it’s mechanism, but there are a couple of things that stand out once you know about them. By the way, it was not called the “Trapdoor” back then, at least by the military. It was the Springfield Rifle (or Carbine), Caliber .45. I thought I knew how the breech was locked until I got one and then got a copy of the old Army manual. Then I found out there was more to it than I previously knew. You open it by unlatching and swinging the breechblock up, and you close it by swinging it down where it latches in place. When the breechblock is latched closed, there is a latch (called the “cam latch”) that holds it closed by keeping the breechblock from being pushed up and open by the firing pressure. That much was obvious from looking at one, and I thought that was all there was to it. Well, there is and there isn’t. It is designed so that when fired, the pressure holds it down and latched tighter. Item “E”, the hinge pin, runs through the hinge pin opening in the breechblock. The hole in the receiver is round. BUT, the hole in the breechblock is slightly out of round. It is elongated fore and aft. 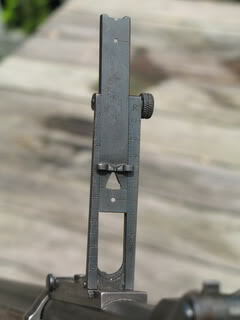 Item “F”, the cam latch, is what latches the breechbloclock closed. Notice that the center of it’s pivot point is lower than the contact surface of the latch. 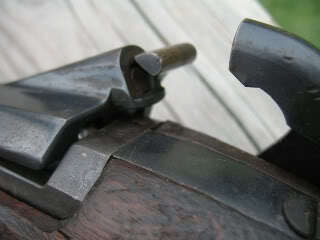 When the rifle is fired, the elongated hinge pin hole allows the breechblock to push backward just a little. It hardly moves, but it does move. As it comes back, the cam latch rotates slightly since it’s contact point is below the centerline of it’s pivot point. This rotation cams the breechblock down, holding it closed tighter. Small detail, but one that is simple, clever, and an important one. In 1884, the “buckhorn” rear sight was replaced by a new design called the Buffington sight (named after the Colonel in charge of Springfield Armory at the time). Compared to the previous sight, it is both simpler and more complicated. It offered an easier windage adjustment and a battle sight that blocked less of the target, but its also had five different notches or apertures that can be aimed through and was adjustable from 200 to 2,000 yards. This is a built in compensation for bullet drift. When a bullet is fired from a rifled barrel, it has a tendency to drift in the direction of it’s rotation. 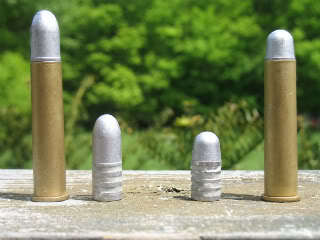 A bullet from a RH twist barrel will tend to drift to the right. I think the theory is that the larger and heavier the bullet and perhaps the lower the velocity, the more it will show this effect, but I’m not sure. The new sight compensated for this by sending the aperture and notch to the left as it is raised. According to the manual, SA had the best marksmen test rifles at various ranges using some rifles having RH twist barrels and some with LH twist barrels. At each range, the groups got farther apart laterally due to the rifling twist causing drift. SA then halved that distance between the groups to determine the amount of drift caused by the rifling, and used that info to know how much to make the sight compensate. How much drift could there be? The manual lists the results in 100 yard increments to 1,000 yards. At 100 yards, the bullet has already drifted 1.29 inches. At 300, it’s 5.1 inches. At 500, it’s 11.5 inches. It’s almost 4 feet at 1,000 (which takes 3.29 seconds to arrive at). With the rifle, that is inside the mean accuracy standards, so I suppose it was worth addressing. With the Carbine, I’m not so sure since at all ranges, the Carbine’s accuracy acceptance standards exceed the amount of drift. I don’t know if the possibility of 5″ of drift is worth worrying about when the Carbine is shooting a group of almost 12″. I don’t know how far they ever shot them in actual combat either. But I still find it all rather interesting. There are other small details to it if you look for them. The thumbpiece used to unlatch the breechblock has an arm that blocks the hammer from the firing pin if the latch isn’t completely closed. The hammer can be cocked and the trigger pulled if the breeckblock is open, but it will fall on this arm. It has an actual ejector, not just an extractor. Regardless of how fast or slow the breechblock is opened, the ejector will “fire” the empty case out of the chamber. A part called the ejector stud in the bottom of the receiver acts as a deflector to send the case flying over the shooter’s right shoulder…if right handed. It should just about catch a left hander square in the face. I’ve read this cartridge ejection was quite impressive to Army officers who examined early samples. Apparently, they thought it was just the neatest thing. I’m not sure why, since there were ejectors on arms before, but I guess that doesn’t mean it didn’t happen. And it’s a simple ejector system. The ejector is basically an extractor with a spring bearing against it. The key is how that spring is located. 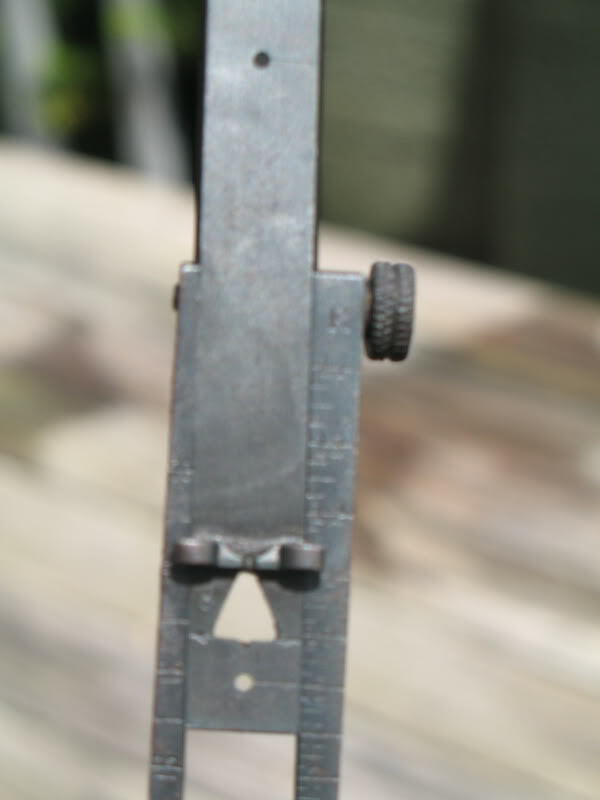 The ejector pivots around the breechblock hinge pin. Most of the time, the spring is applying pressure just above the centerline of the pin and keeps the ejector retracted. 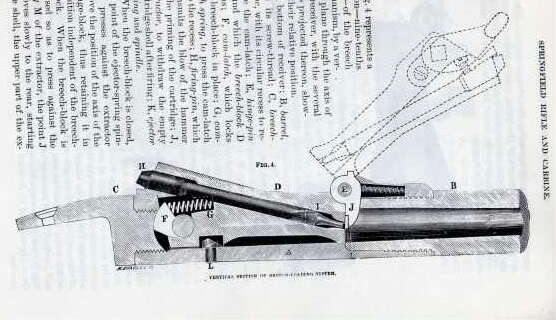 As the breechblock is rotated open, a tab contacts the ejector and rotates it slightly. That is just enough movement to “free” the spring to bear against the ejector on the other side of it’s centerline and kick it out. They made use of cams and overcenter principles in this rifle. There were near-constant improvements being tested or applied to the Trapdoor throughout it’s service. You have to remember there was almost always a shooting war going on. Even though money was almost nonexistant, they had people counting on these rifles so they never stopped developing them. The breechblock got some strengthening changes, the receiver got widened just a little, the firing pin material changed, the sights changed, the trigger was re-shaped…Literally everything from the buttplate to bayonet got changed at some point. Even the ramrod went through a few changes (yes, they call it a ramrod even though it’s really a cleaning rod). So as you can see, it may look simple as a hammer, but there is a lot more to it than first appears.